The homeowner purchased this home just over a year ago, and while the home had some interesting architectural features, it lacked a casual elegance the homeowner desired. The main level living room was lacking a strong focal point and was pretty dark. I came up with an overall plan, which included redesigning the top of the fireplace, and painting the entire built in. 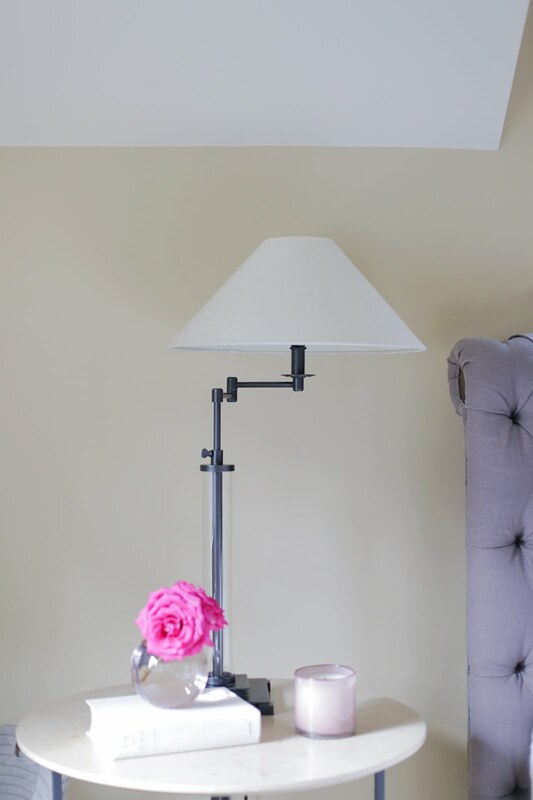 To see more before and afters of this space, head over to Emily A Clarks blog, where she featured all the details on this room. The other side of the room opens into the kitchen. This was a pretty simple facelift. We decided on a black walnut butcher block for the countertop and backless Pottery Barn stools. 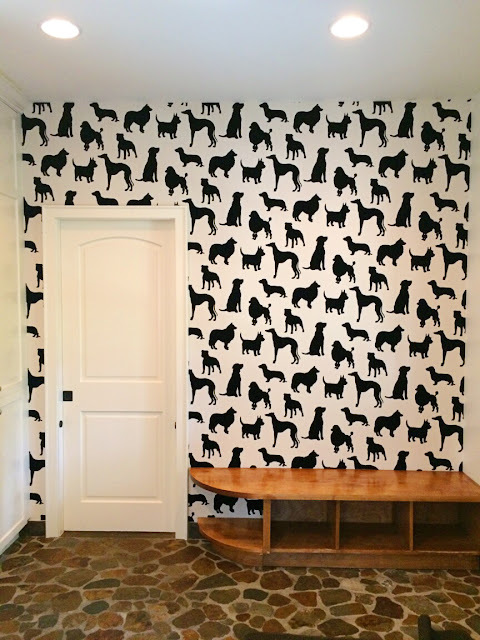 Just off the kitchen is the mud room where we added this amazing flocked wall covering. 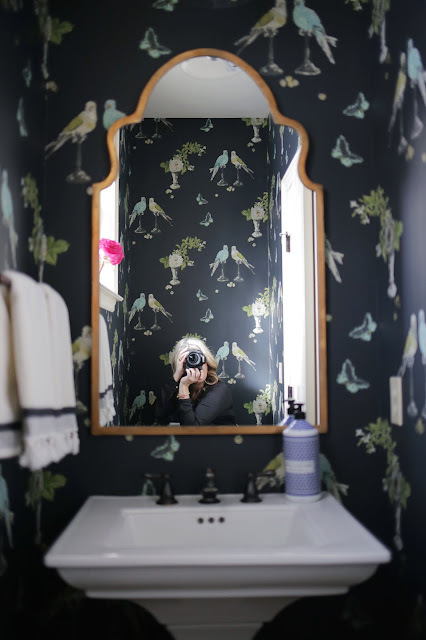 The powder room got a super fun facelift with some new wallpaper and a fabulous mirror. If you squint hard enough you'll see me in the mirror. This room is so narrow making it impossible to get a good after shot! 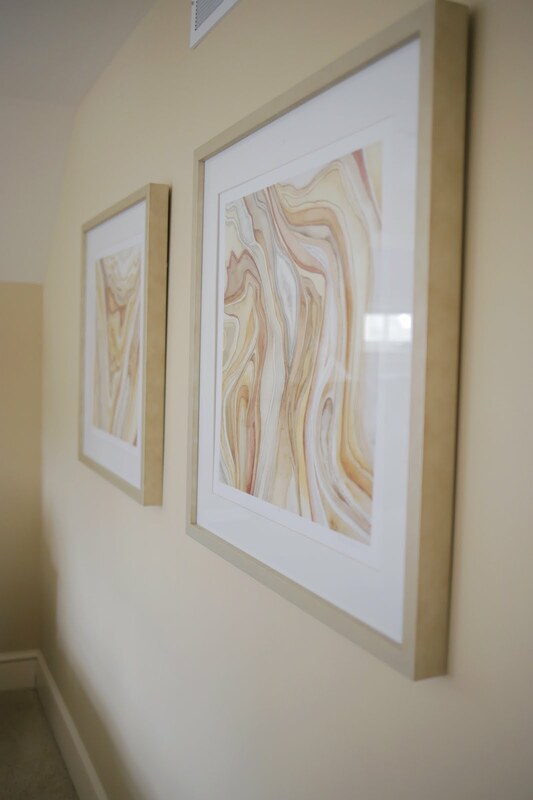 The Dining Room is one of the first rooms you see when you walk into the home, so it needed to have big impact. 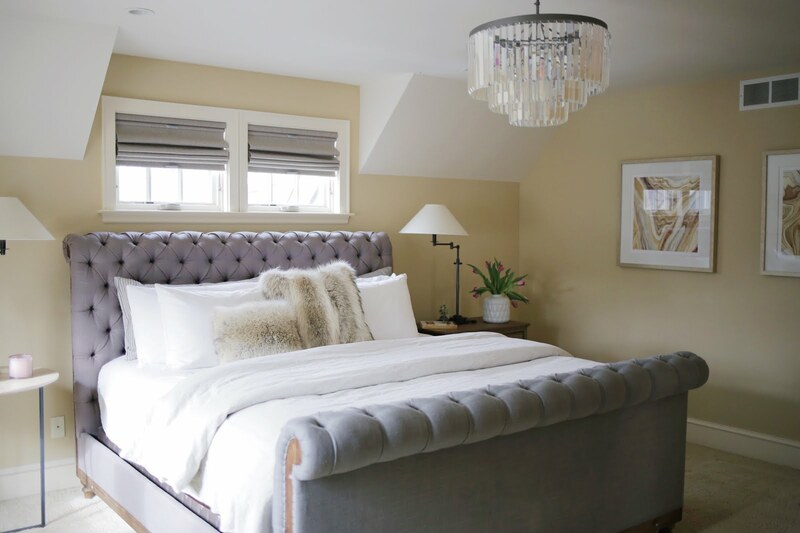 The homeowner purchased this A-MAZING chandelier from Pottery Barn, and we decided on Revere Pewter for the color of the walls. Custom drapery was installed and we replaced the outdated sconces. Heading upstairs, we replaced the carpet runner with a more modern, fresh look. This guy posed for several of my pictures! The Master Bedroom had some great pieces, but they just needed some help pulling the room together. We put some samples up on the wall and chose a paint color, added window treatments, lighting, and new artwork. The room is truly a Master Retreat now. So calming and relaxing. Thanks for stopping by today. 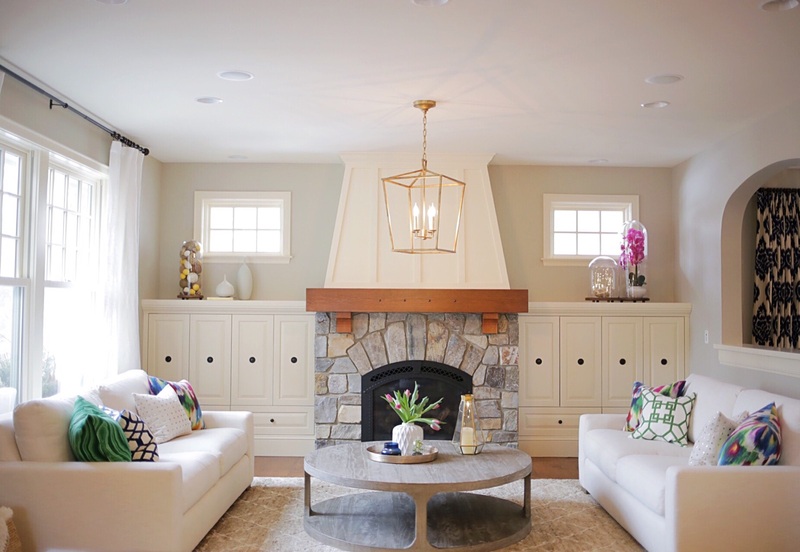 And a special thanks to Emily A Clark for featuring my clients living room on her blog! I just found your blog and love it! I cannot wait to peruse the "eye candy" filled pages! I was wondering if you would mind sharing the source of your stair runner? It is EXACTLY what I am looking for. Thank you so much Michele! I know, the wallpaper is SO fabulous, isn't it? I'm completely in love with this house and what you've done with these spaces, Stephanie!! The Aurora fabric on the pillows in the family room is one of my favorites and the colors and feels of the rooms are so light and cheery. Amazing job!! Thanks so much Lisa! It was one of my favorite transformations to date! Lovely! Where is the carpet runner from? Great transformation!! I would also love to know details on the runner and if the coffee table is the Serrano table by Dovetail. I am looking at that for a client right now and would love to show her how fabulous it looks in this room! This particular coffee table is from Restoration Hardware, but I believe it is the same if not SUPER similar to the Dovetail one! Thanks for stopping by! I would love to know the pattern for the drapes in the dining room! Beautiful home! On Emily's blog there is a photo of a round gold mirror with a hoop on top...can you share the source? Thank you! 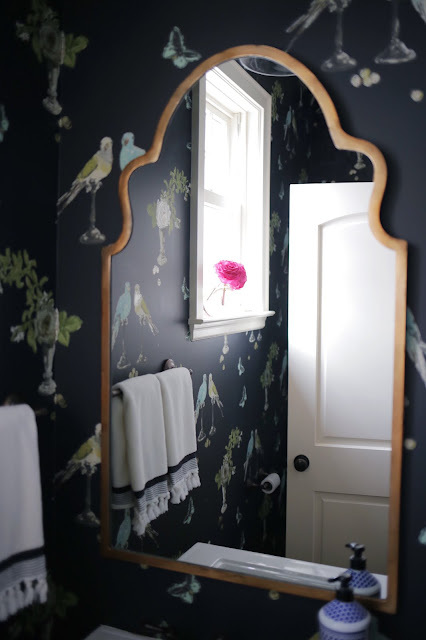 I hopped over from Emily's blog and m curious about the powder room wallpaper. Would you please share the source? Beautiful job on this home. I love it! Hi! L-O-V-E it!!! What is the wall color in the master?? I'm looking to redo ours and I just love this color!! So soothing! I like the interiors of this project. This will be on my house design inspirations.